IB - Tron 3100FAN controller is independent microprocessor controller with large LCD display, dedicated to operate ventilation units. The controller allows to control 3-speed ventilation units, for which a switching signal of gears is short-circuit of suitable lines to common output (e.g. mass of the system, neutral wire etc.). IB - Tron 3100FAN controller allows to regulate air exchange in the building based on programmed timetable or in the manual mode. IB - Tron 3100FAN controllers allow to save energy costs by appropriate adjustment of ventilation efficiency, according to needs. Controllers contribute to protect environment and financial savings. Controllers can be commonly used in: hotels, offices, supermarkets, factories, hospitals, houses and other buildings. 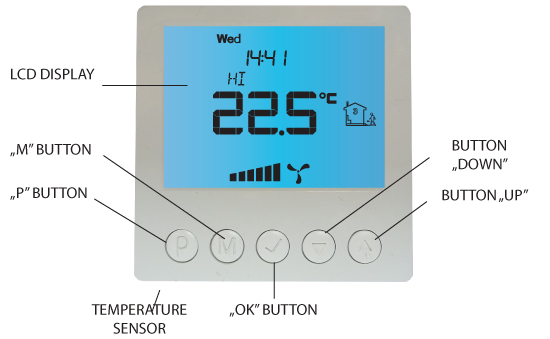 Large, backlit, LCD display which shows current speed of the fan, temperature, settings, a day of the week and other informations. 3 speed of the fan (to choose). Input to connecting a signal of clogged filter of ventilation unit. At the moment of short-circuit this input to the mass or give voltage +12V (choice of using by jumpers), on the display appears information about clogged filter and you will hear a beep. Easy, intuitive operating and programming. Power supply from network 230V with baterry memory backup. 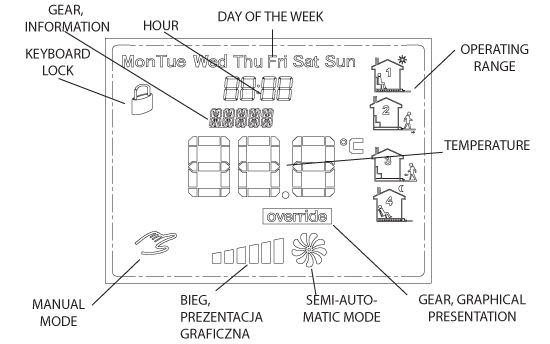 Comprehensive programming process in a weekly cycle with an accuracy of 1 minute and with possibility of programming four time periods each day. Manual or automatic work mode. Displayed temperature with resolution 0,1ºC. During installation of controller, the supply of electricity should be turned off. It’s recommended to entrust the installation a specialized institution. The controller is adapted to work with devices, for which active signal of switching gears is short-circuit of suitable lines to common output. Common output (COM) and outputs of gears are isolated from the power supply - called potential-free outputs. At work in automatic mode, controller at the beginning of each time period turns on programmed gear of central for this period. You can programme four time periods during the day and each of them assign one of three available speeds value. In manual mode, user sets gear of central by himself. The central works on this gear all the time, until it is set another gear or controller is turned off. Always when the controller is turned on, ventilation unit operates on one of the gears - it is not possible to completely turn off ventilation unit. In other words: always when the controller is turned on, one of the gears outputs is shorted to the common output. All of the gears outputs are disconnected from the common output only when the controller is turned off or when signaling of clogged filter is active. IB-Tron 3100FAN controller consists of two parts: main panel with LCD display, keyboard and relay module, with screw connector to connect ventilation unit and power supply. Control Panel is adapted to surface-mounting or to mounting on a standard wiring box (spacing of holes- about 60mm, box- about 75x75mm). Relay module is predicted to be placed inside this box. Both of modules are connected with each other by seven wire cable with a length of several centimeters. „N” - neutral wire 230V AC. „HI” - output of gear 3. This output is shorted to the common output, when controller wants to turn on the 3rd gear of ventilation unit. „MED” - output of gear 2. This output is shorted to the common output, when controller wants to turn on the 2nd gear of ventilation unit. „LO” - output of gear 1. This output is shorted to the common output, when controller wants to turn on the 1st gear of ventilation unit. „SI” - input of clogged filter signal. 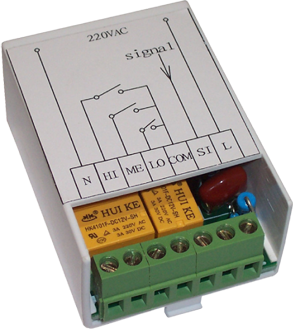 Short-circuit this input to mass or give voltage +12V (choice of using jumpers) causes turning on an alarm. „L” - power phase 230V AC. 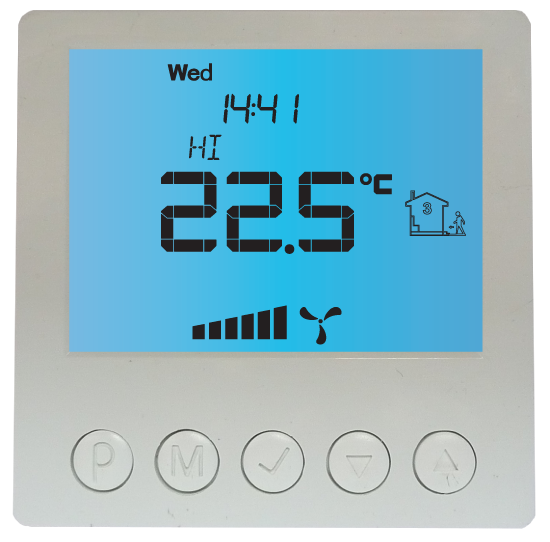 When the controller is turned off, on display is shown only current temperature. No output, which controls gears of ventilation unit is not active. When the controller is turned off, the function of detection clogged filter is still active. To protect controller from unwanted change settings, you can lock controller keyboard. When keyboard lock is activated, on display is visible a padlock symbol and keyboard doesn’t respond to pressing keys. In the automatic mode you can set work timetable. It means automatic setting of programmed unit speed at concrete hour. With timetable you can set lower intensity of ventilation in periods when e.g. building is not used or in nocturnal periods, and higher intensity when building is used. After programming all four time segments the controller returns to standard displaying mode. The fourth time segment lasts until the beginning of the first time segment the next day (e.g. from 9:00 p.m. on Monday to 7:00 a.m. on Tuesday). In manual mode the controller constantly keeps desired speed of ventilation (without work timetable). If controller works in manual mode, on display is visible hand symbol and time segment symbol is not visible. Controller is in the manual mode until user doesn’t change it to automatic mode. In semi-automatic mode is manual speed correction in current time segment. It means setting other speed for current time segment than in the timetable. After the end of the current time segment, controller returns to the automatic mode and works with the timetable. You can move to semi-automatic mode only from automatic mode. When ventilation unit gives a signal of clogged filter, on display is inscription ‚FILTER’ and you will hear a beep ( also when the controller is turned off). After cleaning or changing filter, signaling should disappear.